NICE Clinical Guideline 171 on Urinary incontinence: the management of urinary incontinence in women has been awarded the NICE Accreditation Mark. This Mark identifies the most robustly produced guidance available. See evidence.nhs.uk/accreditation for further details. OAB is the symptom complex of urgency, urinary frequency, and nocturia; it is often associated with the urodynamic finding of detrusor instability. It can occur with UI. Initial diagnosis and assessment of UI, a trial of conservative treatment, and initial prescription of an antimuscarinic drug can all take place within primary care. This can either be via the GP or the community continence service. suspected malignant mass arising from the urinary tract. Reproduced from: National Collaborating Centre for Women’s and Children’s Health. Urinary incontinence in women: the management of urinary incontinence. Clinical Guideline No. 171, London: RCOG, 2013, with the permission of the Royal College of Obstetricians and Gynaecologists. weight reduction is recommended in women who have UI and a body mass index greater than 30 kg/m2. Reproduced from: National Collaborating Centre for Women’s and Children’s Health. Urinary incontinence in women: the management of urinary incontinence. Clinical Guideline No.171, London: RCOG, 2013, with the permission of the Royal College of Obstetricians and Gynaecologists. 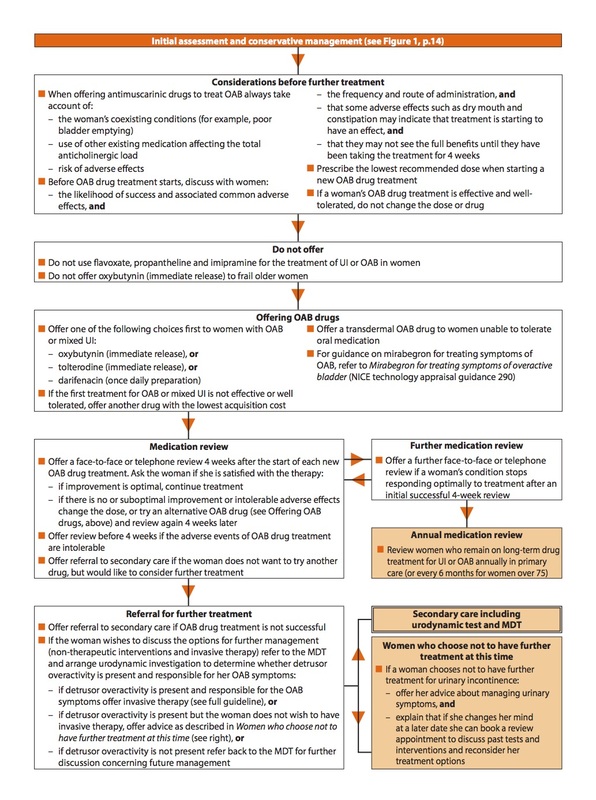 The lowest recommended dose should be prescribed when starting a new OAB drug treatment. If the first treatment for OAB or mixed UI is not effective or well-tolerated, offer another drug with the lowest acquisition cost. The second-line agents recommended by NICE all appear to have similar efficacy and tolerability. Reduction in drug costs (e.g. by local procurement negotiations) may influence the choice of second-line agents. It is envisaged by the guideline development group (as evidence of good practice) that cases will be discussed within the MDT, and that the team’s recommendations will be discussed with each woman to provide her with an informed treatment choice before she embarks on invasive therapies. a member of the care of the elderly team and/or occupational therapist, for women with functional impairments. professionals’ ability to recognise a woman’s capacity to perform pelvic floor contractions. Ideally, pelvic floor muscle training should occur prior to referral into secondary care as it is an effective therapy for stress UI. However, access to specialist training of this kind within primary care is not uniform. The revised guidance regarding this in CG171 was intended to ensure women are taught how to contract their pelvic floor muscles correctly, rather than that they are simply given written information. The requirement for review at 4 weeks after starting antimuscarinic therapy may be problematic for general practice, as more (and potentially longer) appointment times will be needed. However, the review can be carried out over the telephone, as well as in person. 28-day period, the review could coincide with the request for repeat prescriptions. The formation of secondary care MDTs and clinical networks will ensure that GPs can refer women on as necessary, and that all proven treatment options are available to them. Urinary incontinence in women is a common and distressing condition. The costs of containment methods (e.g. absorbent pads) are high; in contrast, treatment of UI is cost effective. Diagnosis can be made by way of a focused clinical history, physical examination, and simple investigations. A trial of lifestyle and conservative therapy is appropriate before pharmacological and invasive therapy are considered. 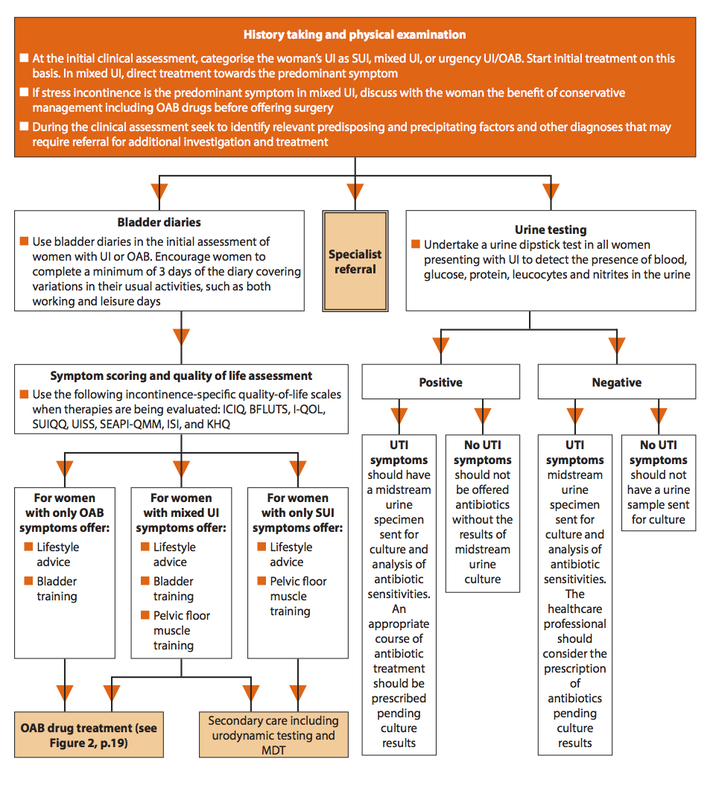 Oxybutynin IR remains the most cost-effective antimuscarinic agent, but its side-effect profile and dosing schedule may not be acceptable to all women, so CG171 includes a choice of first-line medication. The formation of MDT and clinical networks in secondary and tertiary care should mean quality, cost-effective, and uniform care is available to all women with UI. Lagro-Janssen T, Smits A, Van Weel C. Urinary incontinence in women and the effects on their lives. Scand J Prim Health Care 1992; 10 (3): 211–216. Robinson D, Pearce K, Preisser J et al. Relationship between patient reports of urinary incontinence symptoms and quality of life measures. Obstet Gynecol 1998; 91 (2): 224–228. Imamura M, Abrams P, Bain C et al. Systematic review and economic modelling of the effectiveness and cost-effectiveness of non-surgical treatments for women with stress urinary incontinence. Health Technol Assess 2010; 14 (40): 1–188. Hunskaar S, Burgio K, Clark A et al. Epidemiology of urinary (UI) and faecal (FI) incontinence and pelvic organ prolapse (POP). In: Abrams P, Khoury S, Cardozo L et al, editors. WHO-ICS International Consultation on Incontinence. 3rd ed. Paris: Health Publications Ltd, 2005. 255–312. Latthe P, Foon R, Toozs-Hobson P. Transobturator and retropubic tape procedures in stress urinary incontinence: a systematic review and meta-analysis of effectiveness and complications. BJOG 2007; 114 (5): 522–531. Abrams P, Cardoza L, Fall M et al. The standardisation of lower urinary tract function: report from the Standardisation Sub-committee of the International Continence Society. Neurourol Urodyn 2002; 21 (2): 167–178. Sakakibara R, Uchiyama T, Yamanishi T, Kishi M. Dementia and lower urinary dysfunction: with reference to anticholinergic use in elderly population. Int J Urol 2008; 15 (9): 778–788. Wagg A, Verdejo C, Molander U. Review of cognitive impairment with antimuscarinic agents in elderly patients with overactive bladder. Int J Clin Pract 2010; 64 (9): 1279–1286. Ancelin M, Artero S, Portet F et al. Non-degenerative mild cognitive impairment in elderly people and use of anticholinergic drugs: longitudinal cohort study. BMJ 2006; 332 (7539): 455–459. Hughes J, Puangsombat J, Roberts M. The association between anticholinergic load and cognitive performance, elevated blood pressure and presence of peripheral anticholinergic side effects. AMJ 2009;1 (4): 1–27. British National Formulary website. www.bnf.org (accessed 25 November 2013). General Medical Council. Good practice in prescribing and managing medicines and devices. London: GMC, 2013. Available at: www.gmc-uk.org/guidance/ethical_guidance/14316.asp (accessed 27 November 2013).